Don Milne once here once again as Roadtrip-'62 ™ heads out on our thirty-first day of travel along historic US-6. It’s hard for me to believe that it is taking this long to cross the country, but a day like yesterday shows why. It was a very short day, only 15 miles from downtown Denver to Golden, Colorado. No wonder we take so long! But we saw a lot around Denver: the downtown parks and monuments, the Colorado State Capitol, and the U.S. Mint. Today promises to show us a lot of great scenery, but we’ll also find a few surprises. If you see anything you like, get yourself out on the road and enjoy it in person. Sure, it’s fun on this virtual roadtrip, but there's nothing like the real thing! At any time, click on an underlined word below to learn more about the places on the trip. Now, let’s get back on the road again! There is so much to see and do in Golden that we will not get to take it all in. That’s OK though, as I can leave some of it for a US-40 roadtrip. And some places are just too new for our 1962 timeframe, so we shouldn’t be spending our time at them anyway! For example, the Rocky Mountain Quilt Museum only opened in 1990. Long-time Golden resident Eugenia Mitchell got the ball rolling and donated 101 quilts from her private collection. There’s also the American Mountaineering Center, just the kind of place one would expect near the Rocky Mountains. In 1993, the old Golden High School building was converted into the center, and it now includes the American Alpine Club Museum and Library. The library is the largest mountaineering library in the Western Hemisphere, containing more than 17,000 volumes on the subject. Instead of these, let’s start off with breakfast and then I’ll decide what to see first. Other than the Buffalo Rose Bar and Grill, where we ate last night, I’m not sure there are any older restaurants in Golden! Maybe the Golden Diner, which has the right type of name and is located right downtown. Some have called it a decent local utility diner, which sounds like the place may have been around quite awhile. After breakfast, let’s start our sightseeing with the Colorado School of Mines Geology Museum. The museum was founded in 1874 and now displays mineral, fossil, gemstone, meteorite and historic mining artifacts on two floors at the university. There are exhibits of Colorado minerals, a special radioactive minerals exhibit, and even moon rocks collected during the Apollo 17 mission. Of course, there is a gold and silver display, the major local minerals. There is also an outdoor geologic trail with rock outcrops and various geologic and paleontological points of interest, including fossilized dinosaur tracks. Or, if you would rather see art, the main gallery also displays historic mining murals by Irwin Hoffman. Hoffman was mid-20th century artist known for portrait, figure and landscape painting, as well as sculpture and lithography. His brothers owned a mining company and prospected in the southwest, and Hoffman was influenced by the people he saw when he visited his brothers' mining company. I’ll be reading all the scientific mineral names, as I’ve always had an interest in how chemicals are named. Next up is the Colorado Railroad Museum, which features fifteen acres of narrow gauge and standard gauge locomotives, cabooses and other railroad cars. The museum building, which is a replica of an 1880s depot, features over 50,000 old photographs, papers and railroad artifacts. The museum opened in 1959: perfect for our 1962 roadtrip! Then and now, their mission is to preserve a tangible record of Colorado’s dynamic railroad era. Many Colorado railroad companies were closing in the late 1940s and 1950s, due to falling ore prices and increased operating expenses, which made businesses unprofitable. This enabled collectors, like museum founders Robert W. Richardson and Cornelius W. Hauck, to build large collections of railroad equipment and artifacts. The museum slogan is “Lose Track of Time” and I’m sure you could if you tried to wander around long enough to see everything. We’ll just spend a couple of hours at most. Out in the railyard, you can visit the roundhouse, which is used for restoration and includes a working turntable. Or, if you want to think smaller, you can watch the G-scale garden railway or go inside to marvel at the HO-scale model railroad. The last time I visited, I was building my own HO-scale railroad at home, so I walked away with lots of ideas. We’ve already visited a couple of Catholic shrines along US-6, at Hobart, Indiana and Arapahoe, Nebraska. But you might want to stop at the Mother Cabrini Shrine here. The shrine is dedicated to Saint Frances Xavier Cabrini, the first naturalized citizen of the United States to be canonized by the Roman Catholic Church. She became a saint in 1946 and this property became a shrine the same year. Originally intending to establish missions in China, she was advised instead to help Italian immigrants to the United States and is known as the patron saint of immigrants. Mother Frances Xavier Cabrini established a summer camp for an orphanage in Golden operated by the Sisters of the Sacred Heart, and in 1912 discovered a spring which thereafter supplied the only reliable source of water for the property. A replica of the grotto of Lourdes was built over the spring in 1929, and replaced by the current grotto in 1959. A statue of the Sacred Heart of Jesus, was erected at the highest point of the site in 1954. The stairway to the top of the mountain follows the path Mother Cabrini took, and is used by pilgrims today. Because of her work in New York City and Chicago before coming to Colorado, there are also shrines in those cities. We just have time to squeeze in a tour of the Coors Brewery before a late lunch. Coors was founded here in 1873 by Adolph Coors and his partner Jacob Schueler. It has grown from a small building near the foot of Castle Rock to a major industrial complex running nearly two miles along the Clear Creek Valley. 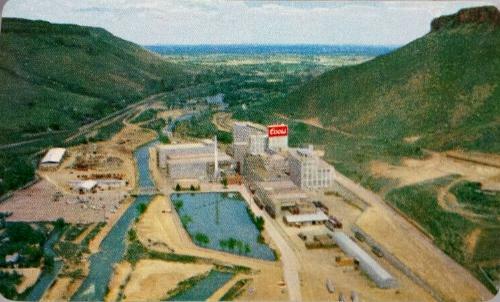 Coors is the largest single-source brewery in the world, and its parent company, MillerCoors, is the second largest beer company in the country. During 1962 and still for many years later, Coors beer was a regional product limited to the western states. Many beers of that period were still regional or local, as only a few companies such as Anhauser-Busch had nationwide distribution. The brewery complex is a huge collection of rather bare concrete buildings that straddle Clear Creek, just east of downtown on 12th Street. The tour includes a walking tour of the brewery and free beer sampling in the Coors Brewery hospitality room. The walking tour highlights the malting, brewing and packaging processes. A museum at the end of the tour displays old photos, historic beer cans, bottles and beer memorabilia. Time for lunch, and what could go better with our beer samples than a good burger? Fortunately, there’s a good burger place right across the street from Coors, Bob’s Atomic Burgers. Bob’s is a locally owned and operated hamburger joint. And while it’s not old, having just opened in 2012, it carries the theme of mid-century décor well on it’s signing and other art, and may make you think you’re in a place from the 1950s or 60s. In fact, the shape and construction of the building makes me think it probably was built back then. The menu has the classics and you can get your burgers topped with just about anything. Pop is served in the bottle, with both Coke and Pepsi, along with lots of other flavors including such vintage favorites as both Dad’s and Oh-So Root Beer. If you want to try something spicier for lunch, maybe you should drive across town first to the El Dorado Mexican restaurant on 8th Street. The building kind of looks like an old dairy barn place, so again, the building may be old enough even though the restaurant is newer. It serves authentic Tex-Mex style food made from scratch. As I mentioned this morning, we have to leave some sites for a future US-40 Roadtrip-’62 ™ journey. Among those are Dinosaur Ridge, a world-renowned geological and paleontological outdoor museum. Bones were first discovered here in 1877 and dinosaur tracks in 1937. In 1994, the former ranch house and barn on the historic Rooney Ranch were renovated to create the Dinosaur Ridge Visitor Center, so you can now visit indoor exhibits too. We also must leave the Golden History Center for another day. The center houses historical exhibits about the Golden area, which the citizens of Golden began collecting, exhibiting, and preserving in 1938. Today they have grown to a permanent collection of over 15,000 items. There are even buildings in the collection, such as the Astor House, Guy Hill Schoolhouse, and the Helps/Pearce cabin. A place that’s gone today, but that we would have seen in 1962, is the Jolly Rancher Company. I’m sure you know Jolly Rancher best for the hard or soft candies in intense fruit flavors. But you may not know that the company also once made ice cream and chocolates. They did so until 2002 in Wheat Ridge, Colorado, just east of Golden. Golden was the home of the founders Bill and Dorothy Harmsen, and it was here they began the business in 1949. Jolly Rancher’s original candy flavors were grape, apple and Fire Stix (probably hot cinnamon). We could have bought all their goodies in any of their "Ranch Maid Ice Cream" stores in the Denver area. Time to leave, as we have a lot of miles to cover today and it’s already past one o’clock. Today, US-6 takes a bypass around the west side of town, but it probably used to go right through downtown on Washington St. and then west on 8th St., as that curves to connect to the new road on the north side. We leave Golden on Clear Creek Canyon Road, which was opened in 1952, though construction began in 1937. It was a politically difficult road to construct, as it required abandonment of a railroad and the cities along the route each argued for different road locations. Vail, Colorado favored widening US-40, south of Golden, while Denver wanted to use Clear Creek Canyon for water reservoirs. But the first couple of tunnels were completed by 1941 and construction continued after World War II was over. We’ll go through all six remaining tunnels today; the seventh was abandoned in 1998 and boarded up. Upon leaving the highway interchange at the west side of Golden, you are instantly in the canyon, with your view limited to less than a hundred feet each side of the road. If you are interested, there are several parking pulloffs where you can access a creekside trail. The road is full of curves, which accounts for the low, 40mph speed limit. You can see the creek from time to time, and the first tunnel, appropriately named Tunnel 1, is less than a mile and a half from town. After the tunnel, the creek, which is now a whitewater rapids, appears immediately adjacent to the road and the canyon walls are even higher. We’re climbing up into the mountains and Clear Creek is flowing the opposite direction, back to Golden. Farther up the creek we enter Huntsman Gulch: doesn’t that just sound like we’re out west now? A short distance into the gulch the creek crosses under our bridge, and people are parked and unloading kayaks to run the rapids. Just before Tunnel 2, Clear Creek crosses back to the left side of the road. Tunnel 3 is just around the corner, giving just enough time between them to look around once. All the distance to CO-119 is through Clear Creek Canyon Park and we continue to pass parking areas used for fishing, hiking, kayaking, and even gold prospecting! You might also see eagles or bighorn sheep in the park. Just beyond a few curves, there is the abandoned, boarded up Tunnel 4, where the road originally crossed the creek again. Instead, we cross the creek, much smaller after the junction, on a new bridge a bit farther on. Tunnels 5 and 6 follow, with the creek crossing under us again. Tunnel 6 is much longer than any of the others, and is even built on a curve. If this sounds like a lot of zig-zagging back and forth over the creek, you’re right! You really need to keep your eye on the road through here. We cross Clear Creek one last time in Johnson Gulch and it’s back on the left side where it began. After we cross it, the sides of the canyon turn into a series of hills as we approach the end. The I-70 freeway appears high on the hillside to the left just before our interchange with it at Floyd Hill, where US-6 merges with I-70 and continues with the creek on the left side. At Exit 243, you can get off the freeway and back to the old road, though because it is not along the creek at the exit area, I suspect they tore down part of a mountain to get the freeway through here. We shortly end up with Clear Creek between us and I-70, on our right. Soon, the freeway goes through a tunnel but we continue alongside the creek. The canyon floor has now become wide enough for an occasional house, and a few industrial businesses as we approach Idaho Springs. We seem to come to the end of anything you could call a canyon at Exit 241, where the I-70 Business Loop gets off on old US-6 to travel through Idaho Springs. The railroad through the canyon was the Colorado Central Railroad and it was originally a 3-foot narrow gauge line. Built in 1872, it was the first railroad to penetrate the Rocky Mountains. It was constructed to serve the mining towns along the way: to get the gold out and supplies in. Clear Creek Canyon is the largest, deepest, and most spectacular of around a dozen canyons along the eastern flank of the Rockies in Colorado. It has been carved by a fast-moving stream that has periodically had much great flows, when glaciers on the mountains melted after the ends of successive Ice Age periods. The headwaters are near Loveland Pass, and we will get there after we see Idaho Springs, Colorado. By that time, we will have climbed nearly a mile up the creek. On the way, we will see both metamorphic and igneous rocks: gneiss, schist, and granite up to 1,800 million years old. As is typical of mining towns I have seen all over the country, Idaho Springs is a narrow town, strung out along its creek valley between the mountains that are the source of its wealth. The main street downtown, Miner Street, is a tidy group of recently repainted buildings that date from the mining boom but now cater to the tourist trade. After we leave the freeway, the second building in town is the 6-40 Motel, which I suspect was here before the I-70 freeway. It consists of two buildings and two signs; one of each looks about 1950s or early 1960s. There are several other old motels in various states of disrepair along this east side of town, mixed in with ski shops, gas stations, and some new fast food development. The mix appears to include buildings from the 1950s through 1970s, with some having fallen to apartment status. The former Peoriana Motel has been demolished and was replaced with a Carl's Jr. restaurant in 2009. The best looking of the lot, actually very sharp, is H&H Motor Lodge, almost across the street from the Argo Gold Mine and Mill. The Argo Gold Mine and Mill is a real former mine that closed in 1943 but was reopened in 1976 as a tourist attraction. That means we could not have seen anything but the exterior on our 1962 journey. It closed due to a mine accident that destroyed a drainage tunnel near Nevadaville, Colorado, in one of the several mines that used the Argo Tunnel for drainage of excess mine water. The system was flooded and four miners were killed. Because this was during World War II, the federal government soon ordered all gold mines in the country to close, to move men and materials into mining of metals more essential to the war effort. The Argo Tunnel and mine never reopened. We could stop to enjoy the hot springs, but I’m going to wait until the end of the day down the road. The Indian Hot Springs, on the south side of town, opened in 1863 on mining property where the miners had sadly found nothing but hot water. Bath houses on the property progressively became larger and eventually attracted the well known as customers, including poet Walt Whitman, members of the Roosevelt and Vanderbilt families, Clint Eastwood, and John Denver. Besides a large hot springs swimming pool, there are geo-thermal caves equipped with hot mineral baths. The caves were carved in the early 1900s, but the hot springs were originally used by both the Ute and Arapahoe Indians. Another local attraction is Bridal Veil Falls, visible from the I-70 freeway as you pass or from a small park near the end of 16th Street off old US-6. We’ll go to the park near and take a trail that crosses under the freeway. The falls plunge 600-foot into Clear Creek and the site features a 120-year-old water wheel. The water wheel was built in 1893 to power a small gold ore processing stamp mill. It was moved from its original location in 1946 when it was donated to the city. It has since been restored and rededicated. For something fun and different to do, let’s try a little gold panning! Phoenix Gold Mine, west of town and south of US-6, is a working gold mine with tours. It was first opened in the 1930 and is run by the oldest continuous gold mining family in Colorado. Al and Dave Mosch take you 750 feet into the mountain, where the temperature is about 45°F all year, to show you how mining in rock is done. After your tour, you can try panning for gold in the stream next to the mine. After we leave the mine, you’ll notice that the character of the road is quite different from here west, as the old road, creek, and freeway all run next to each other and freeway construction has blasted a very different landscape from what we would have seen in the gulches of old. Though still beautiful, the valley is wider, with tall rock cuts and wider curves. Some of the rock in these cuts still moves, and the section of I-70 near Idaho Springs is subject to frequent closures to remove rockslides. The freeway also experiences road closures due to snow. At Exit 235, the old road gets off I-70 and travels through what little exists of Dunmont. Beyond here, much of old US-6 has been obliterated or relocated due to freeway construction. Lawson, Colorado is another old mining town and the mountains are riddled with old mines, and not just for gold. Many different minerals including copper, gold, lead, silver, and zinc have been mined in this district. In 1962 we might have been able to visit Lawson’s oldest retail business, the W.E. Anderson General Store. However, it closed in the mid-1960s. Route US-40 leaves us at Lawson and travels north with the canyon. We continue up Clear Creek, which traverses an actual valley with some reasonably flat land and room for roadside homes and businesses. On our way to Georgetown, Colorado, we run alongside Georgetown Lake, a reservoir created by a dam. The park along the lake not only affords great views, but would make a nice picnic spot. And if you fish, the fishing is great right from the shore! You can sit in your chair and try for trout: browns, rainbows, or brook. The lake is frozen over the winter, so ice fishing is also popular. Georgetown has several museums including The Hamill House, Hotel de Paris Museum, and the Georgetown Energy Museum. The Hamill House Museum is a Country Style Gothic Revival house from the 1867-1879 period. It is within the Georgetown-Silver Plume National Historic Landmark District, which was designated in 1966, so the museum probably wasn’t opened until after that. The Hotel de Paris was a real hotel from the local silver mining boom era. It has been the home of the Colorado branch of the National Society of Colonial Dames of America since 1954 and they operate it as a museum of hotels from the mining era. But I’m stopping to the Georgetown Energy Museum, which is unusual because it is located in a fully functioning and operational hydroelectric plant. We can view 100-year-old-equipment, generators, early electrical appliances, and even take a walk through the plant. The Georgetown Hydro plant was built in 1900 and has two generators. The Georgetown Loop Railroad was also constructed during the silver boom, in 1884. The loop in the name refers to the fact that the railroad loops over itself on a 95-foot high bridge. Besides hauling freight, that unusual feature has always made the line a tourist attraction. It was originally an extension of the railroad that ran up Clear Creek Canyon, but with the closure of mines in the area, the last train ran to Silver Plume in 1938. 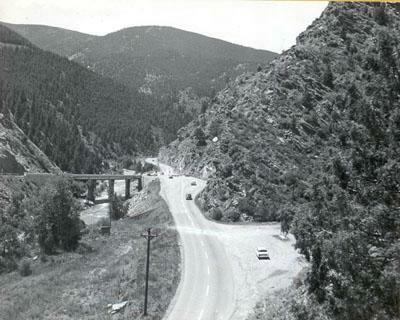 The line from Idaho Springs to Silver Plum, including the Georgetown Loop, was dismantled and the line from Golden was removed in 1941. But in 1975, after years of planning, property purchases and construction, tourist trains again began operating on a small portion of reconstructed track and a replica of the 1884 truss bridge. The appropriately named Loop Road goes right under the loop trestle at the west edge of town, and this appears to have been part of US-6 before the freeway was constructed just up the hillside. If you time yourself right, you can often see the train right from the freeway. Instead of taking the train, I’m driving over to Silver Plume, Colorado. Approaching Silver Plume on the freeway, we reach an elevation of 9,118 feet, or almost a mile higher than we were just back in Denver. Old US-6 exits the freeway here and you can tell this is another old mining town. Georgetown seems to have soaked up most of the tourist activity: there are only a couple dozen buildings left downtown and most are in various states of disrepair. Some consider Silver Plume a “Living Ghost Town”, as only about 200 people live here now. There is a museum we could see today or in 1962, the George Rowe Museum. It opened in the closed local schoolhouse in 1960 and showcases local history. Besides silver, there was a granite quarry here that supplied stone for the Colorado State capital. The route of old US-6 continues west from here, separately from the freeway along Clear Creek. I love the mountains, and am almost giddy to see the snow-capped peaks ahead of us as we continue to climb! At these elevations, you can find snow nearly year round, and there is a noticeable treeline, above which there are no trees on the mountains. Between Silver Plume and Loveland Pass, US-6 passes through the Arapaho National Forest. We rejoin I-70 for about five miles before leaving again to head through Loveland Pass, where US-6 climbs to the Continental Divide at 11,992 feet, the highest point on any federal highway. There is a parking lot at the top, with spectacular views in all directions because you are above the treeline. You are literally on top of the mountains here, with no higher ground near the road for a moment. Most of the six-mile climb has been without guardrails, so you may want to rest your nerves up here for a bit. The downhill grade is listed at eight miles: be sure to check your brakes before you start! The downhill side uses the valley of the North Fork of Snake River. These two water routes make Loveland Pass fairly easy to navigate, which is probably why there has been a road here since 1873. Other than about a half dozen switchbacks right at the top, they are steady but not too steep climbs or descents. And they take US-6 through some of its most scenic areas. The area is surrounded by ski resorts: we pass Loveland Ski area near the beginning of our climb up the pass, and Arapahoe Basin Ski Area just beyond the summit. The huge parking lots and main buildings are right along the highway. Be careful when driving by: you may just meet a cross-country skier on the road! And the snow gets deep and dangerous both on the road and off. Five snowboarders were killed in an avalanche near Loveland Pass, Colorado on April 21, 2013, after apparently triggering a backcountry avalanche. While searching for the bodies, authorities closed part of US-6. Coincidentally, this was Colorado's deadliest avalanche since 1962 when seven people were killed at a different location near Independence Pass. Whereas US-6 goes over the pass, I-70 goes through the mountain, through the Eisenhower–Johnson Memorial Tunnel. The westbound Eisenhower Tunnel was completed in 1973 and the eastbound Johnson Tunnel six years later. The westbound bore is the highest vehicle tunnel in the world at 11,155 feet above sea level. This tunnel is named after President Dwight Eisenhower, who was a major facilitator of initiating the interstate freeway system. The eastbound bore is named for Edwin C. Johnson, a Colorado governor and U.S. Senator who worked to have an Interstate Highway constructed across Colorado. As with many large public works projects, the idea of having a tunnel under the Continental Divide in Colorado began long before the project reached construction. A test, or pioneer bore, was made under Loveland Pass in 1943 and a construction bid was received in 1947. It was far beyond engineers’ estimates and the next bid was not prepared and opened until 1956. By that time, the Interstate Highway System was a reality and the need for a tunnel was even more important, as it was found impossible to go over the mountains while maintaining interstate standards. Colorado constructed approach roads from both sides and finally obtained a pioneer bore in December, 1964. Obviously, US-6 continued to take the old road throughout 1962. The height and difficult terrain of the Divide has also meant hiking trails are harder to establish here than back east. Unlike the Appalachian Trail along the spine of the Appalachian Mountains, which was open from Maine to Georgia by 1937, the corresponding trail along the crest of the Rocky Mountains is much newer. 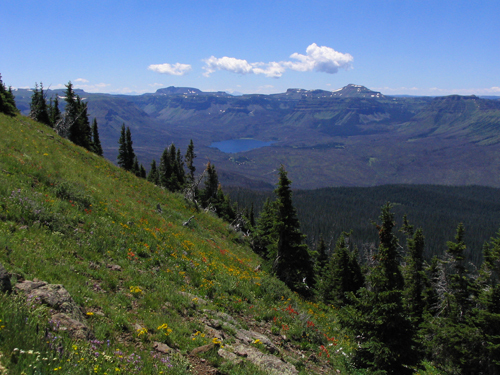 The Continental Divide National Scenic Trail was first declared in 1978 legislation and was only opened after 1985. Even today, it is considered only 70% complete and portions must be traveled by walking on nearby roads. It crosses US-6 somewhere west of Georgetown on its 3,100 mile journey from the Canadian border in Montana to the Mexican border New Mexico. Often much higher than its eastern counterpart, the Continental Divide trail varies from 4,000 feet to over 13,000 feet in elevation. The Arapahoe Ski Basin, just past the summit, is known for its extended ski season, sometimes staying open into early July, whereas most other northern ski areas close in early April. The resort was opened in the 1940s and has some of the highest skiable terrain in North America. We pass their Legends Cafe, right at the foot of the mountain. Arapahoe has probably had a restaurant since before 1962, so this is a good stop for a snack. They serve both inside the classic A-Frame building, and outdoors. I’ll sit outdoors a spell and enjoy the high country a bit longer. The Keystone Resort ski area, just down the road, offers some other diversions if you come in the winter. While I don’t ski, I might be convinced to take a sleigh ride, dogsled tour, or even snow tubing. Both resorts are within the White River National Forest, which was established in 1891 as the White River Plateau Timber Reserve. It was just the second such reserve in the United States. We’ve been in the forest since we left the Arapaho National Forest and will leave near Vail. Besides the ski areas, there are 8 wilderness areas, 4 major reservoirs, and 10 peaks higher than 14,000 feet in elevation within its 2.3 million acres. Between Keystone and Dillon, Colorado, the valley widens enough to fit condo and commercial developments and US-6 becomes a divided highway. The original town of Dillon was situated very close to the confluence of the Blue River, the Snake River, and Tenmile Creek, and this area is now referred to as "Old Dillon". But the confluence of these three rivers makes this a great spot for a reservoir and that’s what is here now. Lake Dillon was originally a small, naturally-formed lake until 1961, when the city of Denver constructed a dam so they could have a water reservoir. Underneath the west side of Lake Dillon, the original town is still visible from under the water. We first see the lake about midway between Keystone and modern-day Dillon, as the valley becomes broad enough for ranching and farming. I suspect there is an older US-6 underwater in "Old Dillon". Old maps indicate that a route from “Old Dillon” directly to Frisco along Tenmile Creek served US-6, but today we rejoin the I-70 freeway at the new Dillon and travel around the north end of the lake. Of course, everything here is newer than 1962. In fact, the adjacent town of Silverthorne, Colorado was not even shown on 1962 maps. Skirting the north shore of Lake Dillon, we come to Frisco, Colorado. Frisco has the appearance of a mostly new town built on an old townsite. The buildings on Main Street are largely from the 1990s or later, but the street grid layout and some of the buildings a couple blocks back are clearly older and remodeled. The Frisco Lodge has been welcoming travelers since 1885. And though the Frisco Historic Park & Museum only opened in 1983, its collection of thirteen historic structures were all constructed before 1962, so we would have seen them in other parts of the area on our roadtrip. As near as I can tell, Main Street, which parallels the path of Tenmile Creek, was once US-6. Where the creek turns west of town, we now rejoin the I-70 freeway and there is no sign of the old road. But I-70 has been carved through the valley very beautifully, mostly on top of the old 2-lane road, so you can enjoy the ride with much wider vistas than we would have had in 1962. And the builders appear to have wanted you to enjoy the vistas, as there is a scenic turnout just before the Copper Mountain ski resort. West of Copper Mountain, there is a bike trail along West Tenmile Creek that likely was the location of the old US-6. It occupies a creekside location typical of older highways, whereas the freeway is constructed up higher on the sides of the valley, one direction on each side of the creek. This is not at all a likely location for the old 2-lane highway, so I guess the only way to truly follow that route through here is to take a bike ride! Five miles down the road, at Exit 190, is a rest area right at Vail Pass (elevation 10,662), where we change from going uphill along Tenmile Creek to heading downhill along Black Gore Creek. Just beyond the rest area, part of old US-6 is driveable as the entrance to the Black Lakes Picnic Site. The site is a facility of White River National Forest and there are two small lakes nearby that are formed by dams on Black Gore Creek. You can have a picnic, enjoy a nature trail, or go fishing. Ahead is Vail Pass, which was not a historical route through the Rockies. Fittingly, the pass was named for Charles Vail, a highway engineer. Prior to 1940, the most common route westward was over nearby Shrine Pass, just to the south, which leads to the town of the Red Cliff in the upper Eagle Valley. In 1940, the construction of U.S. Highway 6 bypassed Shrine Pass in favor of the current route to the valley of Gore Creek. Vail Pass is the only pass in Colorado with a paved bike path on both sides for the entire distance. Some of that bike path occupies old US-6’s roadbed. Approaching the city of Vail, the current westbound runaway truck ramp appears to occupy the old US-6 roadbed up to Polk Creek, after which the road is not open to traffic until the Gore Creek Campground and hiking trailhead just east of town. Vail was founded as a ski resort and opened for its first season in December, 1962. It was incorporated as a town four years later. The ski area was founded by Pete Seibert and local rancher Earl Eaton. The pair raised money from Denver investors and though the resort owns property at the base of the mountain, most of the skiing occurs on mountains in White River National Forest owned by the United States Forest Service. By 1969 Vail was the most popular ski resort in the state. If you want a view from the top down without skiing, you can take Red Sandstone Road out from town. The climb up this dirt road is gradual and steady as it winds its way up along Red Sandstone Creek and then Indian Creek. Watch for mountain bikers as you head for the high point near the trailhead for Lost Lake Trail. Another popular attraction in Vail is the Betty Ford Alpine Gardens. The gardens is located just off the freeway at Ford Park, but is far too new for our roadtrip. It was named for Mrs. Ford in 1988. Across the entire Vail area, we follow on or close to the old US-6 route on the south frontage road of the I-70 freeway, near beautiful, swift-flowing, rocky Gore Creek. West of town, the freeway goes downhill through some fantastic rock cuts to reach our junction with US-24 at Dowd, Colorado. Here, that highway joins us and in 1962 it traveled west with us to Grand Junction, Colorado, where it ended. Today its western terminus is just a few miles from here, near Minturn, Colorado at an intersection with I-70. We last crossed US-24 at Napolean, Ohio. The route was 1709 miles long in 1962 and began in Pontiac, Michigan. With the shortening in Colorado and a bit of lengthening to Clarkston, Michigan, it now travels only 1540 miles. The Denver and Rio Grande Railroad, known by 1962 as the Denver and Rio Grande Western Railroad, and today as the Union Pacific Railroad, also parallels US-6 west from here, having come down the Eagle River Valley with US-24. This is the mainline from Pueblo, Colorado to Salt Lake City, Utah. And a strikingly beautiful mainline it is! After World War II, the Denver and Rio Grande Western realized that it’s passenger train service could not compete on speed with the Union Pacific's faster, less mountainous route, so they decided to market the route on beauty. With their California Zephyr service a rail trip became a rail cruise and it turned a profit for the company from its inception in 1949 through the late 1950s. By the time of our 1962 roadtrip, it was only profitable in the late spring, summer, and fall, but that was good enough. Their partner, Western Pacific, dropped out of the service in 1970, but the Denver and Rio Grande Western refused to join the national Amtrak system and continued to operate its own Zephyr equipment as the Rio Grande Zephyr on this route until 1983. Since about Dowd, the valley is nearly a mile wide and is good farmland. Settlers arrived in the early 1880s and by the 1920s, head lettuce was the chief crop in the area. Being at a high elevation and having rail service, the Avon area provided fresh lettuce to the east coast for weeks after the nation's regular lettuce harvest was over. Since the 1970s, skiing has become big business here: one of the ski lifts to the Beaver Creek Resort actually crosses right over US-6! As a consequence, much of the development is newer than 1962, with condos and shopping villages, and there is little evidence of the original town. Avon is, like Vail before it, mostly a linear settlement stretching along US-6 through the river valley. Between here and Edwards, Colorado, development is still sparse enough that you get good views of the mountains from the broad Eagle River valley. The mountains become lower, without a treeline, which makes them look softer because the rocky granite tops have been replaced by green. Edwards, Colorado has a completely modern downtown, built in a kind of 1890s style. Beyond there to Gypsum, the scenery along the Eagle River includes 30 miles of colorful and rugged sandstone cliffs with red rock layers that look like what I think of as the typical landscapes of the American west. The valley narrows to little more than a canyon in spots, requiring the freeway, the river, US-6, and the railroad to leapfrog over and under each other several times. Where we run alongside the river, there are good views of it. Eventually, the mountains flatten into cliff-edged buttes before we reach Wolcott, Colorado. There is no real town here, no homes, just a few businesses, and the railroad depot is long gone. On leaving Wolcott, the Eagle River plunges into a broad canyon, and US-6 goes with it. As we arrived in Eagle, Colorado, back in 1962, we would have crossed a steel through truss bridge over the Eagle River. It has recently been replaced by a new bridge. The old bridge was built in 1933 and was most recently painted green, which reminds me of a couple of bridges on US-6 back near Meadville, Pennsylvania. The Eagle River valley continues to provide good farming land and hay, grain, and potatoes are raised, along with livestock on the surrounding uplands. Because of this, Eagle also hosts a large agricultural fair. The Eagle County Fair & Rodeo will celebrate its 77th edition in July, 2016 at the Eagle County Fairgrounds. The first Eagle County Fair was held in 1939 but it may have been suspended for a couple of years in the later part of World War II. Perhaps due to manpower or supplies shortages, there was no mention of the fair in local newspapers for awhile. But by 1950, the Eagle County Fair was booming again, with exhibits overflowing the school gym. The fair moved to its current site in 1960, after the old site was sold to a development corporation. At this time, a rodeo arena was added, with grandstands. The event has continued to grow since, with new grandstands in 1999. Other than the fair, Eagle has a small, historic downtown and good trout fishing on the river which runs through town. Leaving town, we pass the Eagle Grand Motel, an older motel in fair shape outside, though it has an older sign that no longer has the name on it, just “Motel”. It looked better in 1962 or in postcards. It may not be obvious because we still see mountains around us, but we’ve already passed the last range of the Rocky Mountains. Until we get to the Wasatch Plateau in the vicinity of Provo, Utah, this will be more of a land of canyons of the Colorado River system. We drive through town and all the way to Gypsum, Colorado adjacent to the railroad tracks, while the freeway is almost forgotten on the other side of the valley. Gypsum is the home of an American Gypsum Company drywall plant and mine. There are other gypsum mines around the country: we passed a former one on our US-23 roadtrip, at Alabaster, Michigan. The mine here contains some of the purest gypsum deposits in North America and American Gypsum, formerly Eagle Gypsum, has been mining here for over 50 years. The mine currently operating is the second one in the area. Because its grade is dropping, the company will close and reclaim it soon. A third mine is currently in development about a mile away, so Gypsum will continue to be defined by gypsum mining and manufacturing. The plant is the first large industry I’ve seen since leaving the Golden area and I’m sure that would have been the same on our 1962 trip. Leaving Gypsum, US-6 folds back into the I-70 freeway and may occupy the south frontage road, which probably means the old road was destroyed during freeway construction. We cross the freeway at the Dotsero exit, and we also cross the Colorado River. Another bridge here looked just like the one that was replaced at Eagle. This one, built in 1935 and closed to traffic in June 2013, is also gone: demolished and replaced with a new bridge that year. Near this point you can see one of the finest examples of a recent lava flow that can be found in the continental United States. The old flow is at the east side of town, north of the I-70 freeway, which actually cuts across it. The flow is rough in appearance due to caverns beneath the solid crust that broke and caved in. Dotsero, Colorado is famous for its volcano, which is the youngest volcano in Colorado. Dotsero Crater last erupted only about 4,200 years ago. 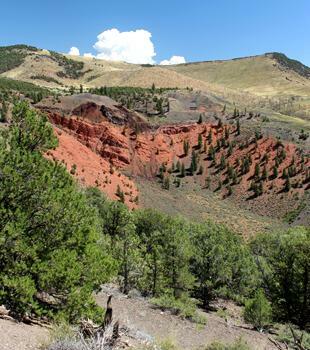 The crater, classified as a scoria cone, is about 2,300 feet wide by 1,300 feet deep. But during the past several thousand years, it has partly filled with sediment, so visitors today see a crater that is about 600 feet deep. We’ll drive up to the lip of the crater and take a short hike to the top, but you can hike all the way down to the bottom too. If you do go to the bottom, you may find a diamond. The Bureau of Land Management notes that dark basalt rocks occasionally will contain diamonds. Underground, things are still hot, as evidenced by Dotsero Warm Springs, south of town where the old US-6 pavement ends. A short hike from a parking lot takes you to the springs. 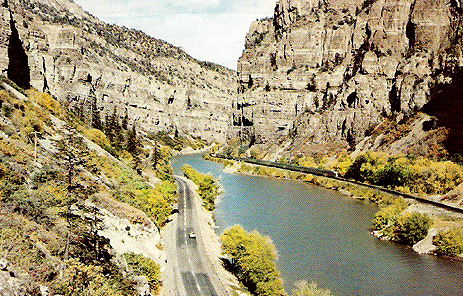 From here, we have to rejoin the freeway to continue through tunnels and Glenwood Canyon, as the old road was mostly removed during freeway construction. There just isn’t enough room in parts of the canyon for two roads, a river, and a railroad. Immediately upon entering the canyon, there are solid rock walls alongside the freeway and along the railroad on the other side of the river. The dramatic scenery, downhill at freeway speeds, feels like you’re driving through part of a video game. In my opinion, this is the most amazing scenery of the entire 3,517 mile journey across the country on US-6, and I recommend you try it once in each direction! The canyon is so narrow in parts that the westbound roadway is on a bridge partly above the eastbound roadway, and the eastbound roadway is itself on a bridge over the river! And then, it gets even narrower, so the westbound roadway abandons the gorge and goes through a tunnel! I’m not sure how they ever got the old US-6 through here, as they did not build so many bridges back then. This freeway is simply an engineering marvel. Finally, the whole freeway crosses the Colorado River and the railroad, and enters twin tunnels. You can just see the old roadbed on the other side of the river before you disappear into the hole. At Exit 125 on the other side of the tunnel, you can actually use part of the old road, backtracking a bit to the Hanging Lake Rest Area. Unfortunately for us, things are so tight in the canyon that this is an eastbound only interchange, so we cannot get down to the site unless we drive ahead 4 miles to the next exit and turn around. Not today; we’ll continue rocketing downhill instead. The only building I saw in Glenwood Canyon is the Shoshone Hydroelectric Plant Complex. There has been a small hydroelectric plant in the canyon since 1886, but this larger one was completed in 1909. There is no dam on the river because there is enough elevation drop at Shoshone Falls to produce power. Water is routed from above the falls through a 13-foot tall tunnel in the north canyon wall and down two penstock pipes to the generators. The tunnel is over two miles long and the penstocks drop the water 165 feet. But the electricity is not the only thing the plant supplies. Because of the water rights it holds for the water used, the Shoshone Hydroelectric Plant keeps enough water flowing in the Colorado River to retain the whitewater rapids important for rafting, kayaking and fishing. And the water level, which is thereby higher than it would be if water were removed from the river for farming, improves the water quality for cities downriver. Even if you do not take a rafting trip yourself, you’re sure to see kayakers and rafters as you drive through the 1500-foot high canyon. This part of the Colorado River is rated as a Class III river, and is marketed as suitable for first time rafters or families with children who want a bit of a thrill in their day while enjoying amazing scenery. There are several river outfitting companies operating in Glenwood Springs ahead. Though I couldn’t identify any dating back to 1962, a couple have over 40 years of experience. A lot of the action can be seen beyond the Grizzly Creek rest area. We soon pass a wide spot where another creek enters, and an interchange labeled No Name. After No Name, you can drive part of the old road or use part as a bike trail. It stays with the river today but the freeway takes a shortcut through a tunnel. Soon, the steep rock walls of the narrow canyon resume before suddenly, within another mile, we are in Glenwood Springs, Colorado. It’s been a long day today, 148 miles from Golden. Tomorrow we will see the town but tonight it’s is just time to stop and relax. I’m staying at the Glenwood Hot Springs Lodge, where I also stayed in 1977. The lodge is sandwiched between the freeway and old US-6, which fittingly is on 6th Street. It was established in 1888 and is known as the largest mineral hot springs pool in the world. Besides the pool, the lodge offers water slides, mini golf, and an athletic club. Don’t worry about the age: the lodge recently completed a multimillion-dollar renovation that included all 107 guest rooms. And we don’t need to worry about breakfast tomorrow because lodging includes a complimentary full breakfast at the poolside Grill Restaurant. Hot Springs Lodge & Pool managed to stay in business during the low tourism period of World War II because the U.S. Navy set up a hospital and rehabilitation center for injured serviceman. The pool was enlarged in the late 1950s and the smaller, hotter therapy pool was also added. The spa and athletic club are more recent additions since 1962. Of course there are other places to stay, from the historic and elegant to the inexpensive and modest. At the historic end of the spectrum is the Hotel Colorado, opened in 1893 and also boasting a mineral springs pool which at one time had a lighted fountain in the center. The Hotel Colorado has played host to presidents William Howard Taft and Theodore Roosevelt. At the inexpensive end are older places like the Starlight Lodge, which has no pool, the Silver Spruce Motel, and the log cabins of the Ponderosa Lodge. Most are at the west edge of town and have probably been there since before 1962. Today, they are joined by modern chain motels. Also at the west edge of town are some older restaurants, like the Route 6 Grill House, in a building constructed to look like a log building. It’s right next to Vicco’s Charcoalburger Drive-In, a vintage drive-in restaurant. I’ll hunt for something to eat a bit later, but right now, I’m just going to relax in the hot springs pool. I know you can’t join me, but you can watch the Glenwood Hot Springs Lodge promotional video. See you tomorrow here at Roadtrip-‘62 ™, all relaxed to continue our journey!